Pork Lo Mein, Peanut Sauce, from Thyme for Cooking's Weekly Menu Planner. 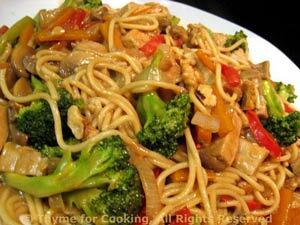 Lo Mein is simply a stir-fry with noodles, spaghetti, in this case. I would normally put peanuts with this but, I had walnuts and rather liked the effect. Besides, they're good for us! Everything cooks in less time than the spaghetti.